The PXIe-8880RT is a modular PC in a PXI Express 3U-size form factor. The following figure is a functional block diagram of the PXIe-8880RT. Following the diagram is a description of each logic block shown. The PXIe-8880RT consists of the following logic blocks on the CPU module and the I/O (daughter card) module. The SO-DIMM block consists of three 72-bit DDR4 SDRAM sockets that can hold up to 8 GB each, for a total of 24 GB. The AMD Radeon E6460 Embedded GPU drives the graphics with DisplayPort 1.2 output display. 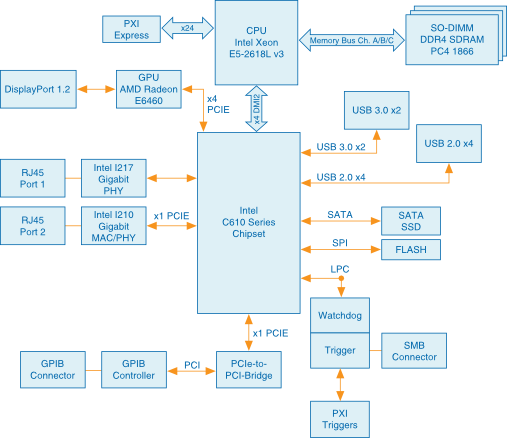 The Intel C610 Series chipset connects to the SPI, USB, Serial ATA, PCI Express, and LPC buses. The USB Connectors connect the Intel C610 Series chipset to the Hi-Speed USB 2.0 interface and USB 3.0 interfaces. The Serial ATA Solid-State Drive is a 240 GB or larger notebook solid-state drive. The Serial ATA interface enables transfer rates up to 600 MB/s. The solid-state drive also supports Native Command Queuing. The PXI Express Connector connects the PXIe-8880 to the PXI Express/CompactPCI Express backplane. Both the I210 and I217 Gigabit Enet ports connect to either 10 Mbit, 100 Mbit, or 1,000 Mbit Ethernet interfaces.